Does the Color of a Roof Affect the House's Temperature? 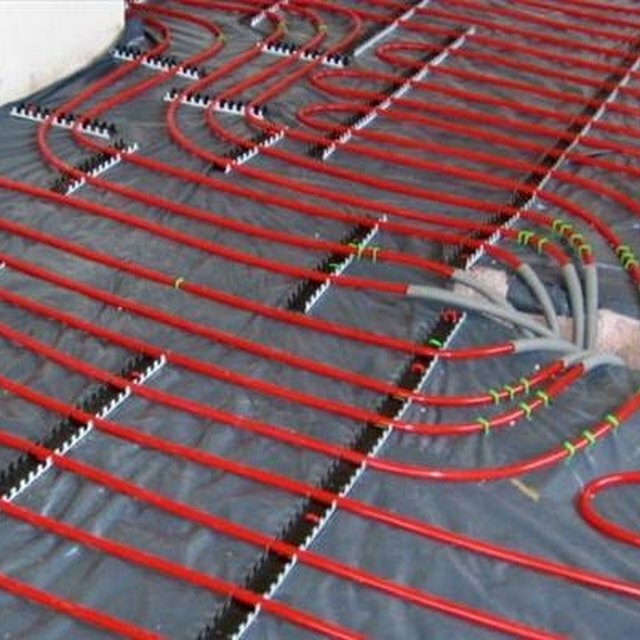 While radiant heating can, in some cases, be a more cost efficient way to heat a house, its design features may also help to effectively cool a home. The best way to do this depends on what types of materials are built around the radiant heating system and tweaks you can make to the system. Hydronic radiant heating systems are built with water lines under the floor and into the walls and recycle hot water through them through a hot water heater, which in turn heats the walls and the floor. This can be done in exactly the opposite fashion in the summer to cool the walls and floor, though it may entail buying a system which will regularly cool the water. However, just having fresh cool running water through the system beneath the floor itself will help to make the entire house cooler as it will be moving some of that heat which has absorbed into the water in the house away from the living area. Walls and floors should be built under a non-insulating material like cement or wood, so that the heat from the radiant heating system can easily transfer the heat into the house. As these layers are thin, they'll also easily release heat and remain cooler in the summer, so keep this in mind when building your radiant heating system. When trying to cool the house, simply turn the radiant heating system off, close the windows and doors and pump the air conditioning for a bit, so that the walls and floors around the radiant heating system become cool for an extended period of time. By installing a water cooling system to your radiant heating system, all the water in the house which once warmed it can now cool it in exactly the same fashion. These water cooling systems run off very little electricity and if the floor and wood materials are built out of the proper materials (as mentioned above), to efficiently conduct cool temperatures throughout the house. While you can install this yourself if you have the proper tools and instructions, it may be best to hire a radiant heating system professional, so that this cooling addition doesn't interfere with the heating functions. What Is the Purpose of a Radiator Cap? What Is the Difference Between Radiant and Convective Heat?